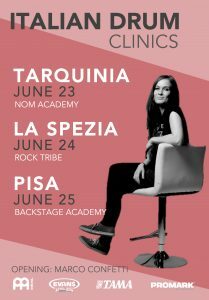 3rd edition of Anika’s GROOVE CAMP is coming up in Tuscany this year! In addition she’ll be in Italy right before the Camp for 3 Clinics. CLICK HERE AND WRITE MARCO FOR MORE INFO AND REGISTRATION. Anika built up a name for herself over the last six years as a Youtube sensation, boasting more than 17 million views on her drum videos featuring original compositions, as well as being a solo artist touring through Europe, China and North America. Anika’s playing style is distinguished by her strong groove, her finesse in technique, and her unique sound! Her use of the drum set as an expressive instrument rather than just a rhythm keeper allows for some extravagant playing without stealing the focus away from the music. She has released various singles, as well as a debut album “Pikalar” (under Sakurai Records), all of which earned spaces on several of the top music charts all around the world. Upon release, “Pikalar” was immediately listed on the ‘iTunes 200 Top Rock Releases’ chart in the USA and climbed its way to number 113 (a remarkable feat for a mostly instrumental album). 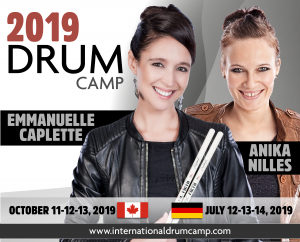 Well known in the drumming community, Anika won the ‘Modern Drummer Readers Poll’ for ‘Up And Coming Artist’ as well as ‘#1 Rising Star’ in “DRUM!” Magazine in 2015 and 2016 as well as beeing voted to `#3 for best educator`on UK drummies awards in 2017. 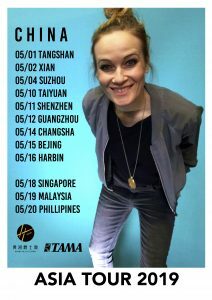 She made it 2 times on #2 for best fusion Drummer by “Modern Drummer Magazin” and lately She won #1 for best Clinician / Educator on “Music Radar Magazin”.